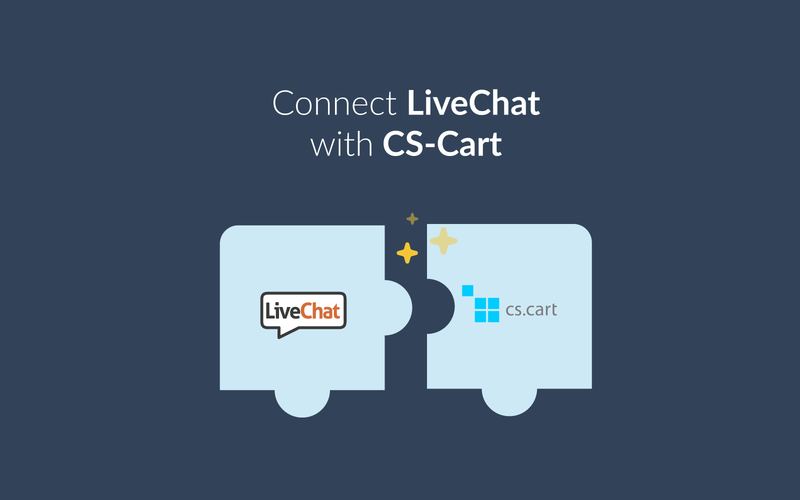 Integrate LiveChat with CS-Cart and start chatting with customers. React to problems when they appear and improve customer satisfaction thanks to efficient support. The integration also enables you to track shopping carts, hide the chat window to mobile visitors and disable/enable chat window sounds. CS-Cart is a downloadable e-commerce platform that helps to build multiple storefronts. Shops created thanks to this tools are SEO-optimized, user-friendly and work fast. The solution provides an intuitive and easily navigated administration panel that equips you with useful features to help your store grow. Thanks to a drag & drop editor, you don’t need to have developer skills to arrange elements on your site. The management system lets you easily organize products and manage features. You can create different layouts for one page and make changes without damaging the layout using the export-import feature. CS-Cart supports cross-selling and offers such tools as Bestsellers, On-Sale or Customers Also Bought that help to attract more customers. Moreover, the built-in marketing system allows you to give discounts or loyalty bonuses that increase sales. Also, the software fosters multi-channel selling. You can place your store widget on other sites or blogs to reach more potential clients. It supports 70 payment services (PayPal, First Data, 2Checkout, etc. ), 8 shipping methods (DHL, UPS, FedEx, etc.) and offers Flexible Tax Management. By integrating CS-Cart with LiveChat, you can provide unbroken support and solve cases from every place at any moment. Choose your favorite device and deliver support also on the go. Integrate CS-Cart with LiveChat and finally determine your objectives like sales or sign-ups. The software will closely monitor all your chats and inform you about achieved goals. Keep your eyes open and learn what you can gain thanks to chatting. Plenty of clients are on the verge of buying when they encounter obstacles that hold them back from closing a purchase. LiveChat comes to the rescue and lets you save your sales. By sending personalized chat invitations, you can act as a real shop-assistant and solve problems once they apper. With LiveChat for OpenCart, you can see what your customers are interested in by checking out their cart. Use this opportunity to target your customers' needs, always being able to provide them with the targeted support. With LiveChat, you can make agents’ work far easier. With canned responses and message sneak-peeks, your support team can find and send answers in a snap. That’s to say; an efficient support team can close more cases and satisfy a larger number of clients. Setting and achieving goals is a crucial part of the business. With LiveChat, you can set your goals and be sure the app will let you know every time a goal has been reached. You will know how much you earn thanks to chatting and which agents close the biggest number of deals. Start using LiveChat with CS-Cart now!